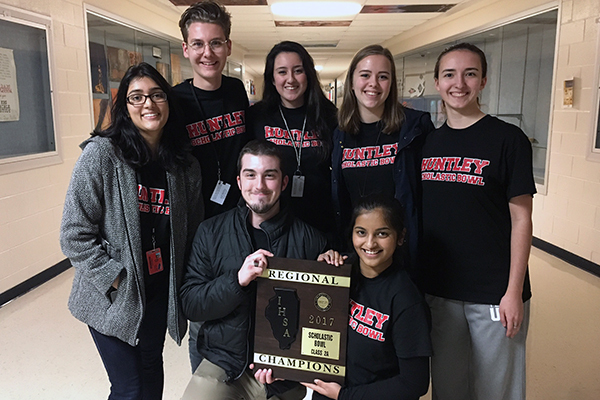 The Varsity Scholastic Bowl team upset Kaneland High School and Prairie Ridge High School to win the Regional Championship on Monday, March 6. With a tie going into the last few questions, the HHS team was able to sweep the second to last question, gaining and holding onto the advantage until the end of the match. The team advances to the State Sectional Competition, a first in HHS Scholastic Bowl team history. The Sectional will be held Saturday, March 11, pitting HHS against Auburn, Marengo, and Newman Catholic. The winner of Saturday’s competition will move on to the finals in Peoria on March 17. Good luck to the HHS competitors!